The Rotherham Harrier black vests were abundant at the British Masters national road relay championships at Sutton Park, Birmingham on Saturday. The Harriers had 7 teams present across the different age groups. All relay legs were run over the same 3.1miles through the lovely rolling terrain of the park on a slightly adjusted and tougher route compared to recent years. 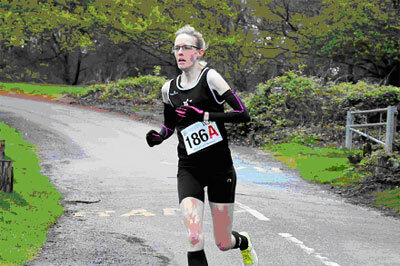 The weather was not what was ordered, cold, wet and drizzly from start to finish ! But the atmosphere soon warmed up once the racing started, first up were the ladies races. 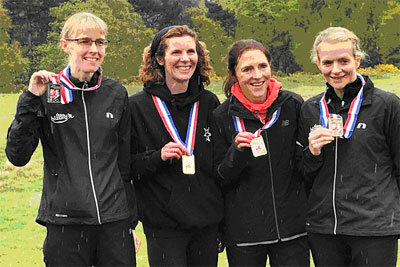 The Harriers ladies W35 team of Sarah Lowery (18:27), Natalie Harris (20:22), Fiona Davies (18:40) and Jenny Blizard (18:30) lead from start to finish and finished over 2mins ahead of 2nd place Derby AC. Sarah and Jenny also scooped medals for the 2nd and 3rd fastest legs of the day. The Harriers ladies W55 and W65 teams both had fantastic runs and both finished a credible 4th place in their age categories. Next up were the mens races the M55 Harriers men of Terry Eastwood, Bob Tintinger and Peter Neal came home in 13th spot. Last up were the M35 and M45 mens races . The M35 team finished 19th with 2 debutants of Michael Stables and Brian Hawkins. In fact this was Michaels first ever race of any kind, not a bad place to start at a National relays ! The Harriers mens M45 A and B teams 8th and 27th respectively. Another great day out for the Rotherham Harriers at this prestigious national event.